Flash is a cranky, bird islander from the Animal Crossing series. His engish name may have been derived from the bright colors of his feathers, as a flash is a sudden seizure of bright light in one or more colors. His Japanese name can translate to many different things, such as to grow up, to rise, to be full (i.e. full moon) etc. Flash's Japanese catchpraise is also an onomatopoeia for a bird's chirp. 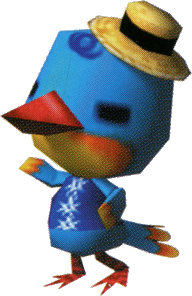 Alongside the other islanders, Flash was not present in the original Doubutsu no Mori, instead making his debut in its GameCube port, Animal Crossing. Flash is a dapper-looking blue bird with blocky, closed eyes. He has a pink-red beak and feet while wearing a straw hat. Under his beak is an orange and yellow mark which covers his entire chin, and up to his beak. He also has a swirl of dark blue hair and the tip of his tail and wings are the same color as his chin. His initial clothes are a Blue Aloha Shirt. Due to being an islander, Flash's cranky personality is different than the normal cranky personality behavior. While cranky villagers are rude, easily angered, and belittling, Flash acts more like the smug personality introduced in Animal Crossing: New Leaf, being gentlemanly and polite, but also arrogant and conceited. This behavior is also shared with O'Hare and Rowan, the other cranky islanders. As an Islander, Flash has a favorite fruit and a fruit that he is allergic to, and feeding him the latter type will reduce the likelihood of him dropping money bags. Flash is allergic to peaches and loves apples. In Animal Crossing, Flash's house lacks any furniture, similar to all other islander houses. He will request from the player a Hi-Fi Stereo, a Blue Bed, a Blue Cabinet, a Blue Bench, a Blue Bookcase, a Train Set, a Kitschy Clock, and a Bromeliaceae, plus the Classroom Floor and Wood Paneling. Once Flash is given all of these items, they will be used to decorate his house. Flash dreams of an eternal summer. When he welcomes you to his island paradise, you'll be taken in by all his smooth talk. Relaxing, swimming, surfing... Actually, it does sound like the perfect life! Modified on March 4, 2019, at 20:58.